SAVANNA'S ROOM || the sweetest wallpaper — MD HANEY & CO.
We have finally started to feel settled into our new home. Moving is such a process, isn’t it? I’m pretty sure the last time we moved I said THAT would be the last time I moved ;) Well, here we are again and hopefully we won’t be moving for a very long time! Now that we are out of boxes, I really want the girls to feel cozy and comfortable here. Their bedroom’s are definitely a priority! Last week my mom and mother-in-law came over and we kicked our rears into gear and wallpapered Savanna’s room in one day! 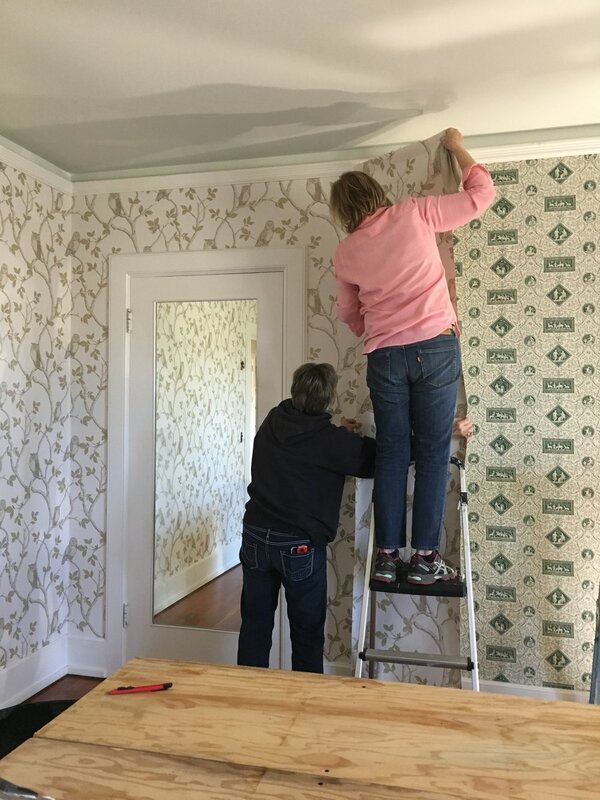 The existing wallpaper was in such good shape, we decided to wallpaper right over it! The wallpaper I found was not pre-pasted. It was a bit more time consuming, however, once I found the right adhesive, it worked out really well! I wiped down the walls, made sure the seams were tight and set up a workstation with sawhorses and plywood. It took us a while to get into our grove, but once we did, it actually went pretty fast! I found this sweet owl wallpaper on Wayfair. I looked and looked and this one was definitely a favorite!! I wanted something sweet and whimsical, fairly neutral and not super expensive. This wallpaper hit the mark on all three!! Would you believe that her bedroom has the sweetest pedestal sink AND a french door leading to a balcony? The character in this old house is unbelievable!! The bedding and rug is from the shop (except the IKEA checkered duvet cover:) and the bed frame is painted with Annie Sloan Chalk Paint, Graphite. Please don’t hesitate to ask any questions about the wallpaper, I am more than happy to help!! Thanks for following along! !